Whether it's as a gift or for own little darling, this baby bath set is always sure to be a hit! Gray stars on the hooded corner give this bath-hand towel a cute detail, which is nicely complemented by the gray, embroidered sheep on the matching washcloth. 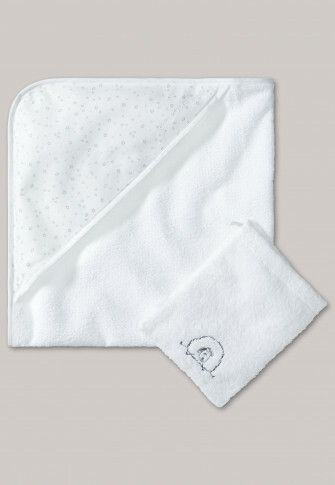 In high-quality, absorbent terrycloth, these two bath accessories feel wonderfully soft and pamper baby's skin all around with the best SCHIESSER quality!